Event Description : Nashist featuring Kipling Book Evening. Discussion around the book “Kipling Sahib – The Raj Patriot”, by author and journalist Subhash Chopra. A journalist, short-story writer, poet, and novelist - Rudyard Kipling is regarded as a major innovator in the art of the short story. Widely knows as the author of "The Jungle Book", he was awarded the Nobel Prize in Literature at the age of 41, making him the first English-language writer to receive the prize, and its youngest recipient to date. 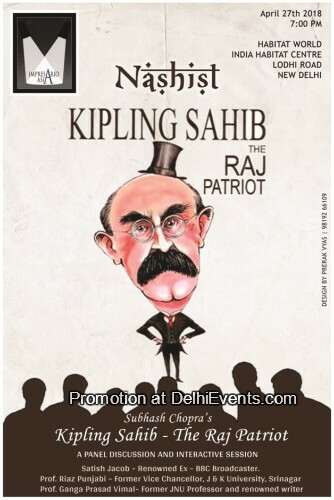 In this month's edition of Nashist, Impresario Asia presents a discussion on the book "Kipling Sahib - The Raj Patriot" written by author and journalist Subhash Chopra. His other books include India and Britannia – An Abiding Affair, and Partition, Jihad and Peace. Now a freelance, Chopra has worked for nearly 25 years on British newspapers, including a long spell on the business news desk of The Times, London. Panellists: Satish Jacob, BBC Editor/Correspondent. Prof. Riaz Punjabi, former Vice Chancellor, J & K University, Srinagar, and Prof. Ganga Prasad Vimal, formerly Professor at JNU and writer.